Ap Strawbale Studio Exhibit Tent. Ruthie in the foreground, Turtle Oven in the background. 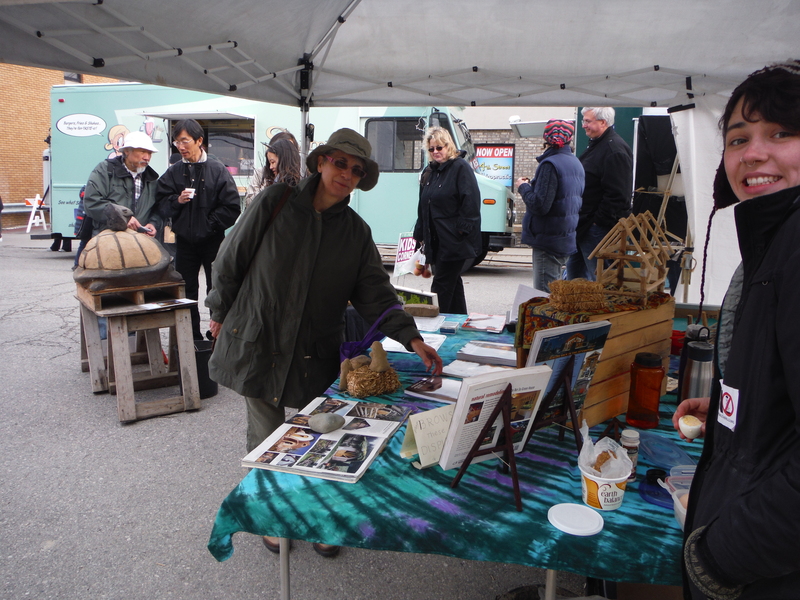 April 26 – 28, 2014, the Strawbale Studio had an exhibit booth at the Earth Day Fest, with books to browse & buy, models to see & touch, workshop & activity handouts, and a place to sign up for the Strawbale Studio listserve. Great interest from people all three days ! Mmmm. 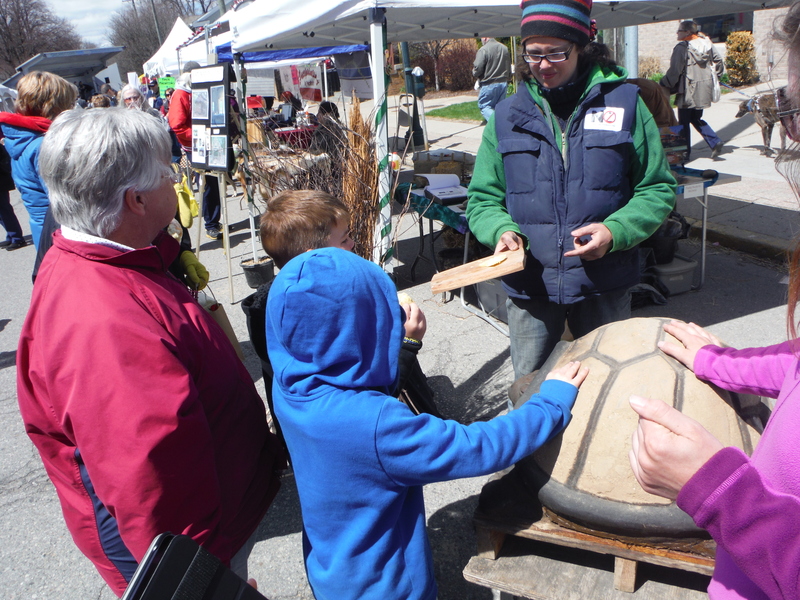 The Turtle oven is warm, and the baked cookies are sweet ! Dawn and Intern Ruthie fired up the “Traveling Turtle Earth Oven, and baked fresh cookies & cheese nachos to share with fair folks. 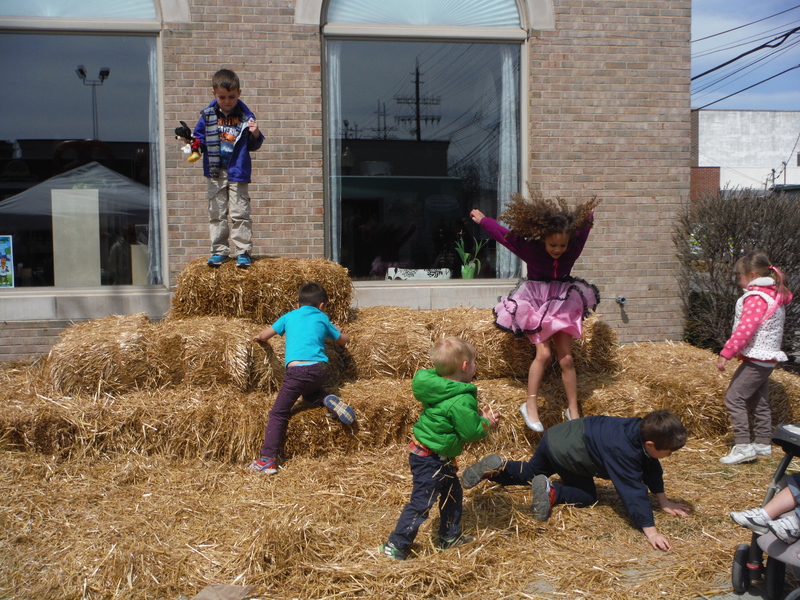 Jumping & crawling on the Strawbale Climb ! April 19th we gathered to learn about how to grown our own mushrooms. 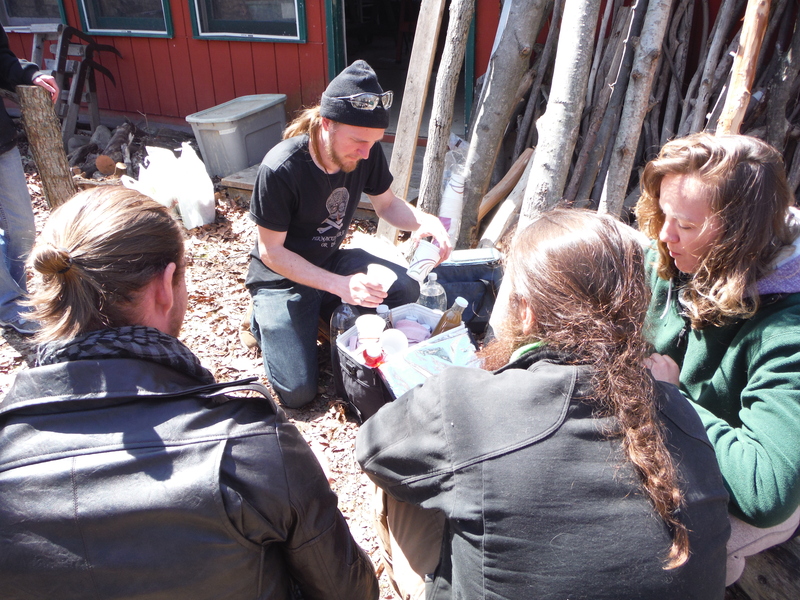 Paul shared from his study and experiences with “shrooms”….and participants inoculated their own log to take home. We were able to tour the mushroom gardens that were put in last year during a workshop, and see how things were going. 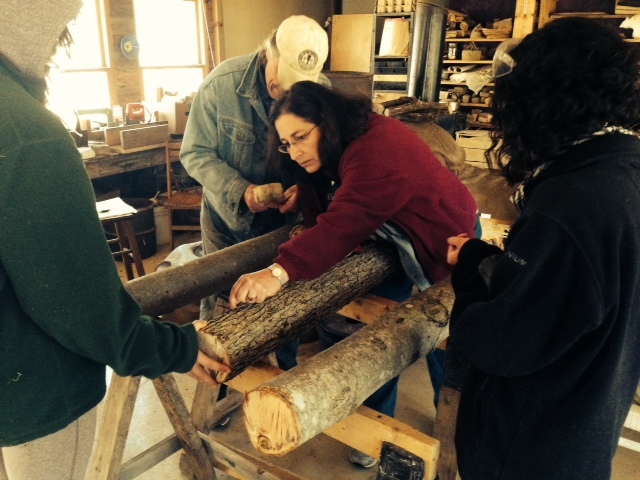 The logs from 2013 are “colonized” with the spores and ready to produce after a soaking process. Several logs have already given a harvest last fall. I had the opportunity to attend this 7-day workshop. View this amazing strawbale video about the event created by my friends Tara and Tyler of “Going Slowly .com”, who also attended this workshop ! Below is an article from the website of our teacher Andrew Morrison of strawbale.com. 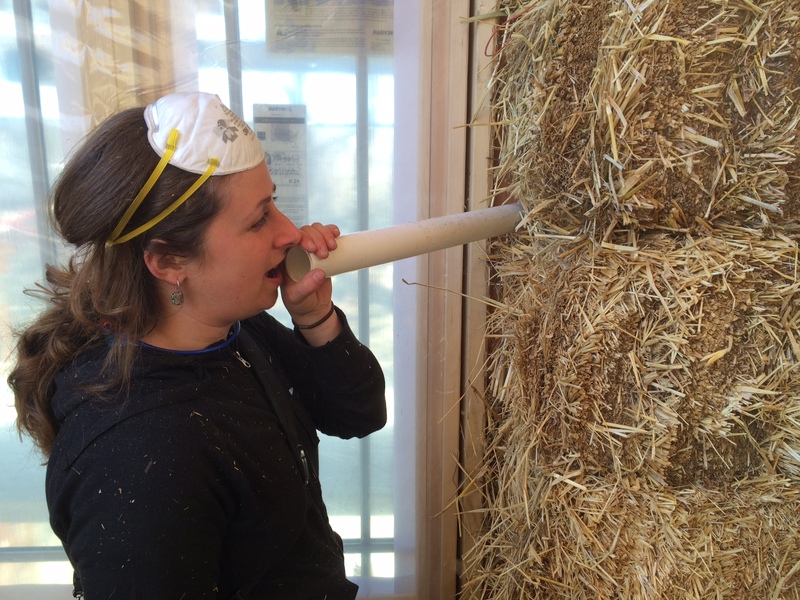 If you’ve ever tried to talk through a straw bale wall during construction, you’ll immediately see the value in this quick tip. For those of you who have not yet experienced attempting to share information across an 18″ thick wall of straw bales, I suspect you will understand the value in this tip as well. As many of us may have heard over the years, in all walks of life: “keep it simple.” This idea, born at the Middletown, Rhode Island straw bale workshop by my new friend Tara, represents that mantra perfectly. On the site we had 31 participants all working in different areas of the home. As if it’s not hard enough to hear through 18″ of densely packed straw, we had chainsaws running, weed whackers flying, nail guns shooting and other additions to the soundscape hindering our ability to hear each other as we tried to straighten our walls. By placing a 1.5″ piece of PVC pipe through the wall (next to windows and doors, or in between bales where applicable), we were able to communicate with the outside tamping crew with ease. You can learn more about Tara and her inspiring life journeys on the website she and her husband Tyler share with the world. Way to go Tara! On another note, the Newport Daily News ran a nice, front page article about our build in Rhode Island. You can click here to read it and even leave a comment! Annually a group of (thoughtful, active and fun) architects and natural building folks come together in the north east to share what is happening in the field. 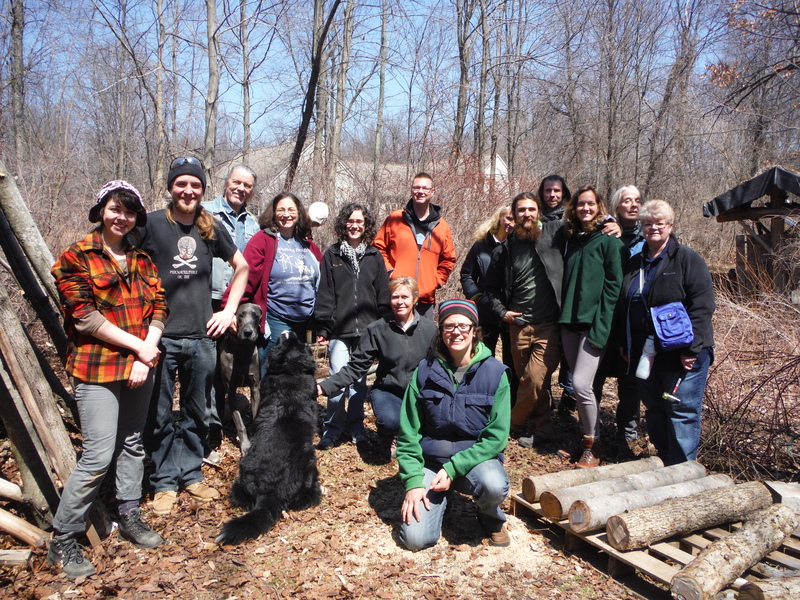 This year I attended this gathering with several colleagues which was held at the Mirthwood Earthship. We also visited the Freeville Earthship (blog and pictures) during a tour of other buildings in the region. Outgoing Tours Freeville Earthship blog and pictures.